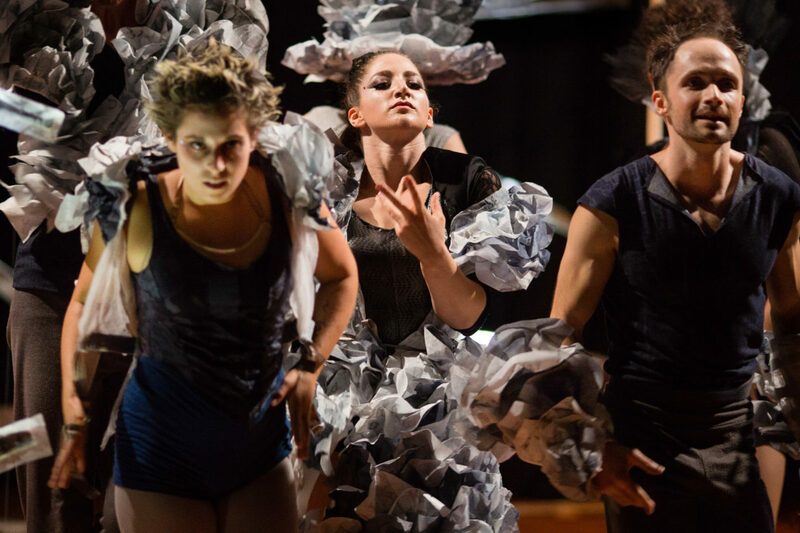 Since its debut in 2012, Acrobatic Conundrum has taken artistic risks to inspire and connect with audiences through the medium of circus arts. The Language of Chance follows suit on a grander scale than ever before. This evening-length show is comprised of two works by two directors, created exclusively for the troupe. Both pieces are inspired by themes from an enigmatic story from magical realist author Jorge Luis Borges, The Library of Babel. KT Niehoff created the first piece, “A Book is Not a Ladder”, in which contemporary dance and circus meld in a visually stunning world. Niehoff designed the striking set and costumes, and created the original sound score in collaboration with electronic musician Pietro Ravanni. In the piece, the acrobats find themselves at odds between the sensations of falling forever, and the Sisyphean task of looking for story in a nonsensical world.